I created simply newgrf, which build logging camp instead of forest in temperate and subarctic climate. Logging camp is similar to tropical lumber mill - it cut trees and produce wood. There is already some newgrf which allow lumber mill to appear in other than tropical climate, albeit it works exactly like lumber mill - must to be build by player. In case of logging camp, this facility appears both on random map creation and during game play, and wood base price is like for temperate/subarctic wood. The aim of this logging camp newgrf is to control tree growth, not only for aesthetic reasons, but also to keep compressed map weight within allowed download time limit. Because logging camp is dismantled when run out of trees, new logging camp would appear in other place of the map and start to cut trees here. Finally we would obtain a natural balance between forest area and logging camp number. 2. logging camp manpower setting - if setting is off, logging camp closure procedure is identical like for lumber mill - in this case industry is more stable, therefore more trees will be preserved. If setting is on, logging camp would be dismantled almost instantly if run out of trees - such settings results in faster rotation of creation/annihilation of lumber mills, and trees would be catted more effectively. 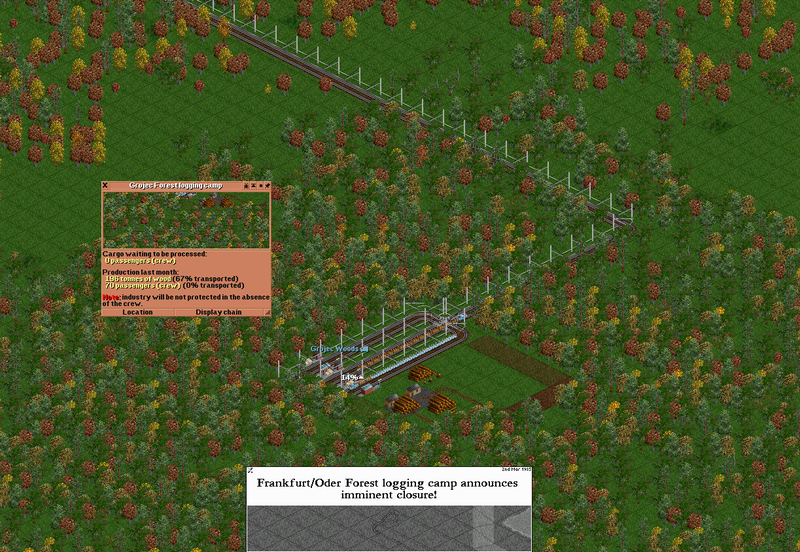 Additionally, with manpower option on, you can deliver passengers to lumber camp - those passengers would be "stored" for while as working crew and protect your lumber camp against closure due to lack of tree. Passengers must to be delivered to logging camp houses. Logging camp have 8 different layouts, 4 flat and 4 with slide. Some layouts are compact, some sparse - my intention was to protect some area against growth of nearby city or other players infrastructure. Some graphics are just opengfx sprites slightly reworked. Top of the hill is rather unsuitable for logging camp. It would protect some trees in high mountains. Some tiles of logging camp layout have special meaning. Grass tiles with heap of logs are productivity indicator - in case of no wood was produced in last month, heap is almost empty. Grass tiles with three trunks are wood transport indicator - in case some wood was transported last month, logs heap appears. but I decided to create standalone logging camp newgrf due to usefulness for long mutliplayer sessions with massive maps. If other industry set is used, logging camp would appear as alternative wood source, instead of forest replacement. Enjoy fruit of my work available on banana tree service. Project source is on #openttdcoop Development Zone. Last edited by McZapkie on Sun Sep 28, 2014 10:09 pm, edited 1 time in total. Ah, that's lovely! 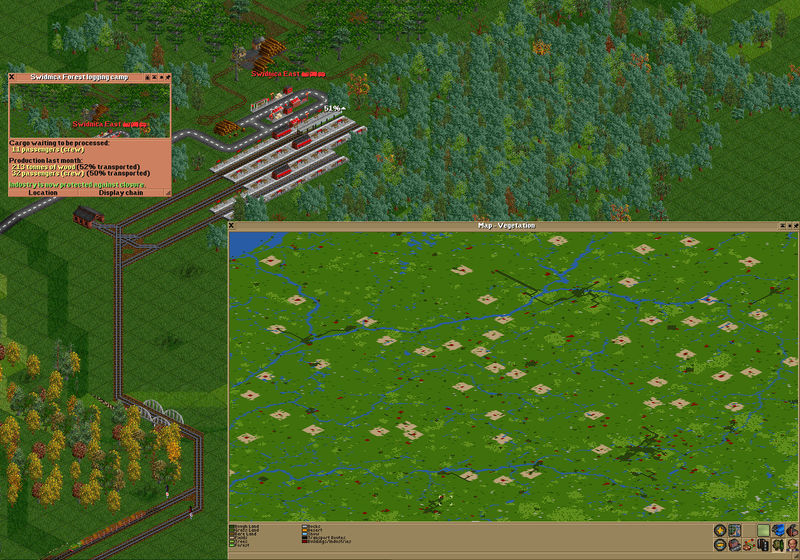 I might actually want to see those layouts in OpenGFX+ Industries, too And / or maybe those wood tracks as objects in OpenGFX+Landscape (or a possible separate NewObject NewGRF). Couldn't you change it to "visiting a historic logging camp site"? I'd like to use this in tropical alongside full FIRS economy, because that one replace the lumber mill with temperate style forest. Would it be possible to make this also for tropical? Animated smoke is useful if you seek for logging camp among the trees. By the way, object have OBJ_FLAG_ALLOW_BRIDGE flag, is it possible to have such flag for industry tiles? Sorry, it looks like a small misunderstanding. Of course, working crew does not protect forest. It protect unused (due to temporary lack of trees) logging camp facilities (all those precious huts and dirty tracks) against dismantling and vanishing. It is working well as long as there are tree within 40 tile range, but you if you forgot to plant new trees, it will be closed. Of course, it would stop producing wood (unless some new will grow), but still will be idle. BTW, you can also see on the minimap, that tree growth is tampered, even after 100 years of game. It is a main purpose of this newgrf. Tropical is disabled, because I need to tweak logging camp layouts - by now, there are many foundations constrains and therefore this industry is located usually in valleys. In case of tropical climate, rainforest is located in mountains - it is maybe a reason, why tropical lumber mill occupy only 4 tiles. Additionally, I can't replace FIRS industries, only original old ones. Maybe I can override FIRS lumber yard Id (0h29), I didn't tried it and I'm not even sure, if such overriding is possible, safe and accepted. Last edited by McZapkie on Mon Sep 29, 2014 2:03 pm, edited 2 times in total. There are many small buildings in FIRS and CHIPS that you could lift if you use GPL. Also ISR. If you want to do it as add-on, there are one or two free IDs but no guarantee they won't get used in future. This is great addition. definitely goes to our multiplayer server standard selection. I don't know how you drew those tracks. I thought you just drew the tracks without ground and use them as overlay on top of the ground tiles which you then would not provide and which would then even adopt to whatever ground a player plays with. Steam in order to find the logging camps might indeed be useful. Bridges currently cannot be over industries, but it might be possible to add such flag to industry tiles, too. It's much easier to add an industry and I'd not recommend to override a FIRS industry - it would tie your NewGRF to an exact version of FIRS (as things might change in FIRS). Replacement only makes sense IMHO when you to mimic also the production changes and adhere to the FIRS parameters. Better add it as an additional industry. New version uploaded to bananas, with more flexible layouts. and you must to fund it yourselves like lumber mill. The reason is, that wood base price is higher than for other climates - I don't want to break such balance. Of course, those track are transparent child sprite, some slopes were missing but now there are complete, all 4 plain slopes. I'm using only GROUNDSPRITE_NORMAL by now and I don't now how those track looks like in case of snow - if contrast is too high, snowy tack must be provided. Thank you, it would be great to add some "look and feel" related to ISR wood station. I changed Industry Id to 3Fh to avoid conflict with FIRS. I'm trying this now with my customised FIRS industry grf. One AI has already set up a wood carrying service. It looks promising, good work. One issue discovered, not sure if it's this grf to blame? An AI created a passenger service (to grab a subsidy). It's in range to pick up passengers but not close enough to deliver passengers. I would consider it as an AI bug - and it would be a good idea to report it to AI thread. It's SimpleAI and I'd doubt that the bug would be fixed. It seems that the path trails are considered part of the industry and therefore produce wood and passengers but only the cabins accept passengers. It could be changed to make the trail ends accept passengers and the 'problem' would disappear. Several of the default industries also do this, so the AI would still be broken. An interesting phenomenon. A new station has appeared that delivers passengers to the nearby town. The logging camp trails fall into the same station catchment area, result is passengers (crew) now get accepted by the logging camp.